A glioma is a type of brain tumor that originates from glial cells, which help support the function of the other main brain cell type—the neuron. Gliomas usually happen in the cerebral hemispheres of the brain, the largest, outermost part of the brain that controls many functions including movement, speech, thinking, and emotions. But they can also affect the brain stem, the lower part of the brain that controls functions like breathing, blood pressure, and heartbeat; optic nerve; and cerebellum, a part of the brain that deals with balance and other nonthinking functions. They can be benign or malignant.Brain tumors are not uncommon; gliomas make up about a third of them. Experts aren’t sure what causes brain tumors. In a small number of individuals, genetic disorders like neurofibromatosis or tuberous sclerosis can cause them. Exposure to radiation may also play a factor. No method is known for preventing gliomas or other brain tumors. •Astrocytoma. This type of glioma is a tumor that originates from astrocytes, the star-shaped glial cells in the brain. •Oligodendroglioma. These gliomas come from oligodendrocytes, which are glial cells shaped like fried eggs. Usually, oligodendrocytes form a cover for nerve fibers in the brain. •Oligoastrocytoma. These gliomas are a mix of abnormal oligodendrocytes and astrocytes. •Ependymoma. This type of glioma comes from the cells lining the cavities of the brain and spinal canal. They are most common in children. •Ganglioglioma. This rare glioma, which can occur in the brain or spine, forms from both glial cells and nerve cells. If you are experiencing these symptoms, see your doctor. Diagnosing a brain or other central nervous system tumor usually starts with a neurological exam, which assesses your reflexes, vision, balance, speech, and other functions. If your doctor suspects a glioma or another type of brain tumor, you may need a diagnostic test like an MRI or CT scan. If you are diagnosed with a glioma, your doctor may recommend surgery. Surgical procedures are often the preferred treatments for gliomas and other brain tumors. If the tumor can be removed without risking neurological damage, your doctor may remove a part of your skull, enter your brain, and remove as much of the tumor as possible. 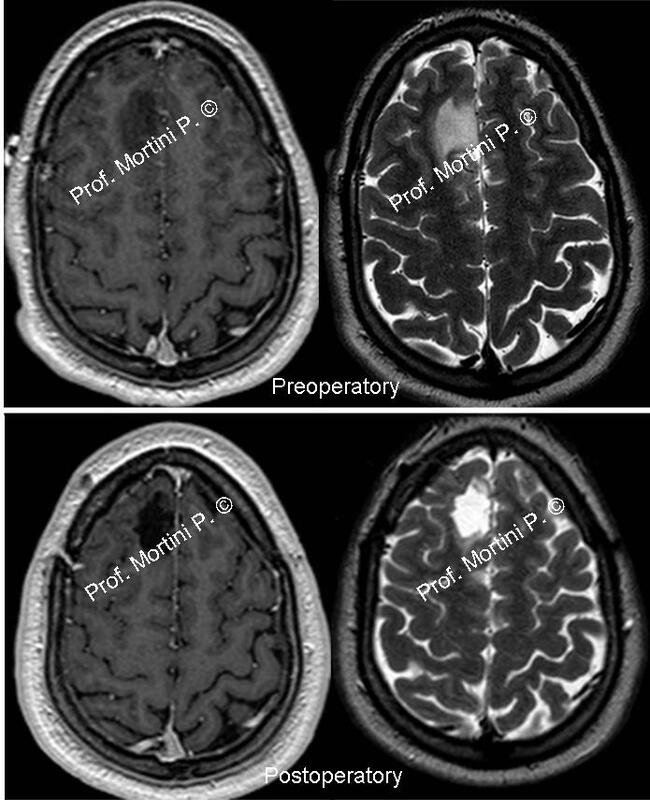 Gliomas can also be treated with radiation therapy. Radiation therapy can be used to destroy any microscopic tumor cells that remain after surgery. If your glioma is inoperable, meaning that it cannot be surgically removed without risking brain damage, radiation can also be used to treat the tumor and relieve your symptoms. Chemotherapy, which involves the use of drugs that stop the growth of abnormal cells, may also be used for gliomas. Chemotherapy drugs can be given orally, through an IV, or placed at the site of your tumor through a shunt. If you or a family member has been diagnosed with a glioma, you may want to consider getting a second opinion. In fact, some insurance companies require a second opinion for such diagnoses. According to the American Cancer Society, it is very rare that the time it will take to get a second opinion will have a negative impact on your treatment. The peace of mind a second opinion provides may be well worth the effort. Your chances of recovering from a glioma depend on many factors, including your age, overall health, and the size and type of your glioma. If the entire tumor is removed, you may fully recover. Young children and elderly adults generally do less well than others. If your motor skills, balance, or other functions have been affected by the treatment of your glioma, your doctor may recommend physical therapy to regain your strength and relearn some skills. Occupational therapy can also help you learn new ways of doing everyday tasks. Skull Base Neuroendoscopic Training Model Using a Fibrous Injectable Tumor Polymer and the Nico Myriad.